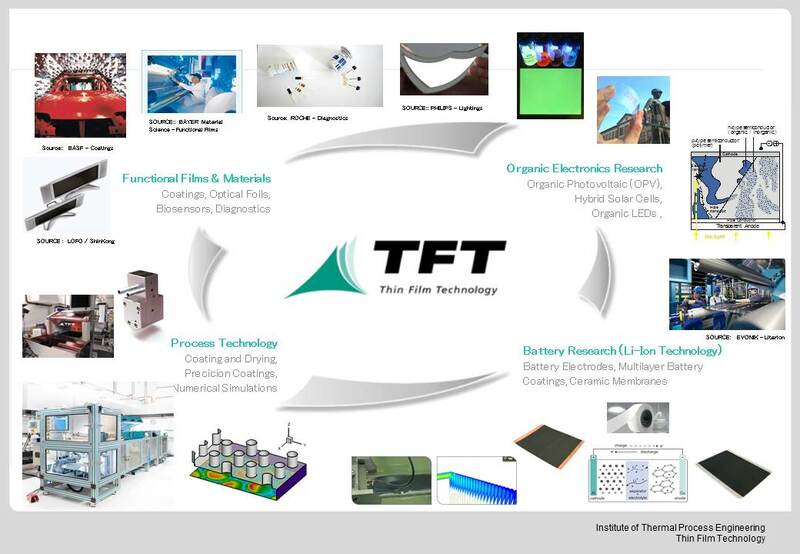 Thin Film Technology (TFT) is a research network and Professorship within the Karlsruhe Institute of Technology (KIT). It was founded in 2009 to meet the growing demand for thin film research in Germany. The university professorship Thin Film Technology at the Karlsruhe Institute of Technology was supported by KIT Elite Future Concept and a consortium of Bayer, BASF and Roche (Shared Professorship) for 5 years. Head of TFT are Prof. Dr.-Ing. Wilhelm Schabel and Dr.-Ing. Philip Scharfer. TFT is part of the Institute of Thermal Process Engineering (TVT) and the Institute of Microstructure Technology (IMT), located at KIT CS in the Materials Center for Energy Research building (KIT CS, MZE), 10.91, 10.94 (altes Maschinenbaugebäude) TVT, KIT CN (Coating & Printing Lab, 717) and the Innovation Lab in Heidelberg. TFT is strongly interconnected to several institutes in the faculties of Chemical & Process Engineering and Mechanical Engineering.